Combine fast-paced vehicular combat with high-tech, futuristic weaponry and hundreds of intense skills and you get Auto Assault -- a unique departure from traditional Massively Multiplayer Online Role Playing Games (MMORPGs). 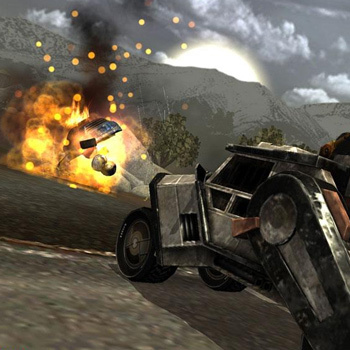 Hop in your own customized cars, semis, and motorcycles and prepare to fight the mutated creatures and bandits of Auto Assault's post-apocalyptic world. Battle other players both in arenas and in epic race vs. race wars for control of the regions in a devastated Earth. Auto Assault uses the power of the Havok physics engine to let you make insane jumps, send obstacles flying and even blast bridges, buildings, fences and trees with your car-mounted rockets. Anything you can hit, you can destroy. Copyright ©2016 Academy of Interactive Arts & Sciences. All rights reserved.